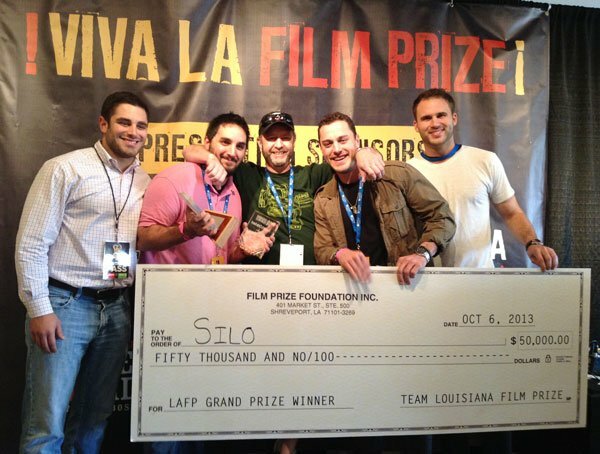 A few months ago, I got an out of the blue invitation to serve as a judge on a short film festival in Shreveport, Louisiana called the LA Film Prize. To be honest, my only knowledge of Shreveport at this point was that it is where the wolves of True Blood come from. But looking over their request and their website, I was intrigued, so I said yes. The event took place this past weekend over four days, and while I went to get a taste of the culture of "the other LA"--as its local film industry calls it--I found a festival extraordinary on so many different levels that I was frankly flabbergasted. In my experience smaller film festivals either focus on star-speckled indie features that will draw in audiences and please their cultural base, or they attempt to focus on the creatives within their own community, encouraging local culture with special awards and attention. LA Film Prize is the latter, but to a degree I have never seen before. Its model offers huge cash prizes, and an incredible ability to give back to the community. Filmmakers and other fests should take notice now. Typically, festivals are costly affairs for filmmakers. First you make a short for several thousand dollars. Then there are fees to submit to festivals. Then if you get into a fest, you have to pay to advertise your film there with postcards, flyers, posters, buttons, and what-have-you to draw people to your movie's screenings. Add to that the price of travel, hotels and meals for your cast and crew to attend and help advertise, and the costs skyrocket pretty quickly. However, at LA Film Prize the 20 filmmaking teams whose shorts are selected are instantly awarded $500 that can be used toward promotion or finishing their film. 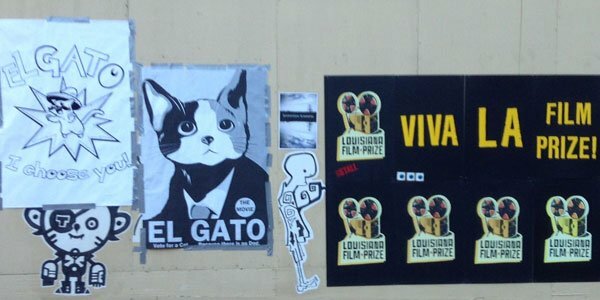 I saw these funds used in a variety of ways, from booths handing out promotional paper fans on a steamy October afternoon, to clever posters like the ones above, which teased a comedy called El Gato about a cat who overruns the life of his owner. There were T-shirts emblazoned with eye-catching poster art from Necrophilia: A Love Story, and a spattering of zombies popping up throughout the venues for the horror short Last Call, along with their mesmerizing onscreen slayer played by one Johnny McPhail. Beyond the swag and living dead floating around the festival, the filmmakers have additional exposure help in the Prize's voting rules. While some festivals hand out a scorecard before every film slate to allow audiences to vote (say on a scale of one to five), LA Film Prize demands all voters—be they judges or general audiences—watch both slates, then provide proof at the voting booth by presenting a card punched upon exiting each slate. Clocking in at two and a half hours each, I worried the slates wouldn't draw crowds. But I totally underestimated the movie lovers of Shreveport who turned out in force, filling one theater after another all weekend long, forcing some judges to scramble to get seats! LA Film Prize founder Gregory Kallenberg told me that a major point of pride of the festival is its earnest attempt to "break down the walls" between its contestants and its judges. In a string of events that ranged from brunches to panels, live concerts, sound stage tours, and pub crawls, my fellow judges and I were repeatedly offered opportunities to get to know the people behind the shorts we were watching. We, who came from areas of writing, critique, marketing, production, and distribution, had the chance to pick their brains, and vice versa in a casual environment infused with energy from the local community. But perhaps most alluring to hungry young filmmakers are those big prizes. Aside from the $500 awarded for being accepted into the fest, there are several chances for filmmakers to go home a winner. The judges pick five films/filmmakers they feel could grow with a bit of funding and these teams are awarded $3,000 in grant money toward their next production. There's also a special award given to the film the judges feel was a cut above the rest in editing, The Crosscut Editing Award. This honor comes with a whopping $20,000 prize in the form of an editing opportunity. Then, the top five films voted most popular by the judges and the general audiences (with each representing 50% of the vote) get guaranteed entrance to five notable film festivals, including the ones in Dallas, New Orleans, Memphis and Los Angeles. These shorts will later be made available on iTunes through Shorts International, the distributor behind the Shorts HD channel and the annual theatrical run of Academy Award nominated shorts. Finally, the film that comes in at number one wins its maker the biggest cash prize any fest gives for a short film: $50,000 no strings attached. By now it should be obvious why LA Film Prize is a draw for filmmakers. But I was impressed at every turn how Kallenberg and his tireless team masterminded a unique and innovative approach to a film festival that has brought back remarkable returns to its community on several fronts. When I landed in Shreveport, I quickly learned about its burgeoning film industry, falling in just behind Baton Rouge and New Orleans. Louisiana's tax incentives for film production help, offering a hefty 30% rebate on below and above-the-line costs. This encouraged Millennium Films to set up a soundstage in Shreveport, which I toured with the filmmakers and judges during the fest. 23 features have been made from this facility alone, including The Expendables, Olympus has Fallen, The Paperboy, and the recently wrapped Dark Places with Charlize Theron. So with all this going on, the local film commission considered bringing a festival in the mix. But when they called in Kallenberg, a noted local filmmaker, to head it, he loathed the idea. "I was brought in by the film commission because they wanted me to help them work on a film festival for the area, and I immediately told them it was a terrible idea and that local film fests were a dime a dozen. Instantly, the room frosted over and I immediately felt like I lost every friend at the table,” Kallenberg recounted. “I asked for a little time to think up something unique and different and, after a bit of time in my cave, came up with an idea that would incentivize filmmakers to their work, and put this amazing place and its people onto a well deserved pedestal." A defining requisite of submitted shorts is that they are filmed in the Shreveport/Bossier area. This not only gives LA Film Prize’s local audience a chance to see their hometown reflected on the big screen, but also stimulates the local economy attracting production teams from nearby as well as crews from California, Texas, Florida, Georgia, Mississippi, Massachusetts, Virginia, Arkansas, New Mexico and Colorado. Only in its second year, the fest has already seen a rise in non-local entries from 30% to 70%. With each film costing an average of $7400, this location requirement has brought an estimated $4.9 million to the region in just two years. On top of that the festival itself generated $400,000 in economic development in its first year. And while the numbers aren’t final for this year’s activities, Kallenberg is expecting them to be far higher considering a 20% rise in attendance, more crews visiting from out of town, and three of the five hotels nearby having sold out. On top of these perks, Kallenberg and company contracted Shreveport food trucks from the likes of Lilah's Bakery, Counter Culture, Salsita's, Po' Boys and Rich Girls to flank their festival space, creating a village vibe flush with local culture and cuisine. A concert called the LA Music Prize kicked off the festivities by showcasing local bands in a competition that was raucous and wildly entertaining. And the VIP lounge was based in Shreveport Regional Art Council's Artspace, which had a kinetic display of print art for visitors to enjoy. So it wasn’t just locally made films that were celebrated here, but local art in many forms. Finally, the winners of the prizes are given strong incentives to return to Shreveport to shoot. For instance, the $3,000 awarded from the Founder’s Circle is less an outright cash prize than it is financing if the crews shoot locally. Likewise, the $20,000 editing award is actually an editing job, cutting a documentary short to further promote the city's music culture. While some might sneer at the strings attached to these prizes, that’s a pretty cynical viewpoint by my count. Filmmaking is a business about connections and collaboration, and these prizes give filmmakers a bit of both on top of funding. And considering the breadth of genres and stories represented in what I saw this year, Shreveport is a land ripe with great locations, plus an infrastructure already established to aid filmmakers. Essentially, LA Film Prize is designed to be more than just a destination to get laurels for your film’s credit; it’s intended to build a relationship between talented filmmakers and a community that’s ready and willing to embrace and support them. “We feel we are on the way to creating a film competition that is nationally important,” Kallenberg told me, adding, “If the Film Prize grows off of this year's foundation, there's no stopping us.” After what I saw last weekend, I completely agreed and suspect this model is one that will soon have filmmakers flocking and other fest’s flat-out stealing ideas. The winners of Founder’s Circle Grants are Silo, El Gato, Last Call, Lineman, and Red River Ode. The Top Five films, which will be made available on iTunes and could hit TV through Shorts HD are Silo, Last Call, Lineman, Red River Ode, and Ruby and the Dragon.